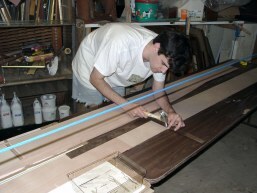 No one makes (or ships) 16 foot long plywood so the first step in the building process was to glue together four pairs of approx. 8 foot long panels that will make up the sides and the bottom (Eight 8 foot long sections are joined to make four 16 foot long boards). Confused? 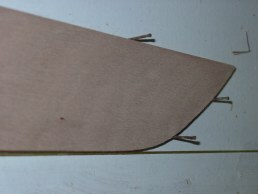 Check out the description of the design of the boat and cross-section diagram here. 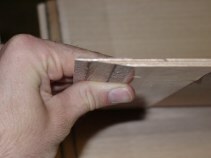 CLC had cut a sharp angle into the end of the boards where they go together (see below). 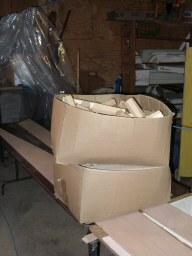 The joint formed when two of these angled pieces are glued together is called a "scarf joint." Because I plan on finishing with only varnish (no paint) I decided to start out by sanding what will be the outsides of the kayak with 180 grit. I probably should have just done this later, but I was quite eager to try out my new sander. Now it was time for the hard part. 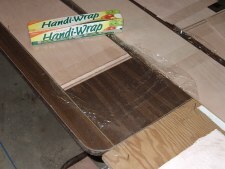 I had to figure out how to properly line up the boards for gluing. They had to be positioned exactly as indicated in the plans. The instruction booklets suggested just stapling the boards to the table but I didn't like the idea of putting holes in the nice wood any more than was absolutely necessary. So instead I made up my own system that involved nailing brads into the table flush with the edge of the wood such that the boards were held in place by the brads (without actually nailing into them). Of course first I had to position the pieces precisely using a string line and a builder's square (90 degree angle). I only needed about five strategically positioned brads per section. See the picture below on the right and you will understand (hopefully). (In case you are wondering, the blue line above is the rope from my tarp system). It was important to make sure I put some brads at the ends to keep the two pieces from slipping apart at the scarf joint as the glue set. After I had everything laid out to my satisfaction (which took quite a while) and all the brads in place I prepared the areas around the scarf joint by putting clear tape along the joint so that any epoxy that squeezes out will be easy to remove by just peeling off the tape. I got the respirator at a home center for $22 and it keeps out everything except lead, choline and asbestos. In addition to the mask and glasses I used disposable gloves. 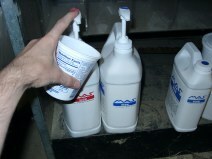 Below: The epoxy comes with handy pumps that are calibrated to dispense in the proper ratios so you can just combine a squirt of hardener with each squirt of resin. 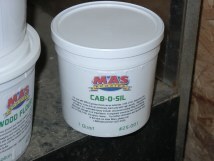 After stirring my combined epoxy for 2 minutes, I added Cab-O-Sil (which is a powder) until the epoxy was the consistency of mayonnaise as instructed in the booklet. 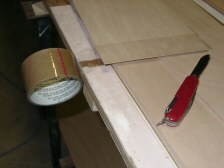 I applied the glue to the scarf joint with a popsicle stick and placed the other half of the pair in its position. After wiping up any excess epoxy and applying another layer of saran wrap, I glued the second pair together on top of the first pair (using the same brads for positioning). After I was done gluing the bottom panels I did the same thing with the sides (using a different set of brads). I placed a piece of scrap plywood on top of all four joints and put two big boxes of scrap wood on top of that so that the weight would clamp the joints tightly together.